How do I reclaim the “other” space on my iPad? I have 3.3 gigs of space in the "other" category on my 16 gig iPad. The space for "other" has grown over time. I've synced. I've powered down. I've turned all running apps off. How do I reclaim this used space that I'm not using? The "Other" space is not necessarily unused as you imply. It could simply be your user data from your applications. If you check in Settings > General > Usage you can gauge how much space your apps are using up including their data (might be photos, or podcasts, or pictures, or anything). If you were to add up your the data in this list, then subtract the total amount of "application" usage from it, it should pretty much equate to the bulk of this "other" data. Of course, there are other things that are included as "Other", including your mail data, sms messages, internal log files and location data stores etc etc etc which may fluctuate over time but the big portion is just your apps contents. I had the same issue - 2 GB "other" space that I couldn't attribute to anything. After seeing Martin's thought I decided to try installing the iOS 6 update, even though I didn't want to. That did the trick, cleared up 1.8 GB. Ideally Apple would provide an easier way to reclaim "other" space. This problem was driving me crazy. I tried everything suggested on numerous websites and forums, until I finally realized what had happened. I installed the programs sugested by many and searched for this other space that was referenced. I couldn't find much, and it was really frustrating. I finally just rebooted it and cleared all the space, so... if you haven't tried rebooting your iPad/iPhone do that. I've just been through the process of finding out what is included in "Other" and clearing it on my iPod Touch (4th Gen, iOS 5), so I believe the following should apply to the iPad as well. I had 2.3GB in the Other section as reported by the iTunes bar. This does not include the data within the apps, they are shown as the App section of the iTunes bar and itemised as shown in stuffe's post. The majority of it (2.2GB) was pictures and video taken using the camera, still in the Photos app in Camera Roll. I found that out using DiskAid, which allows you to copy them to your PC/Mac. Right click and Get Info on folders in DiskAid shows you how big each one is. Note that the Photos section of the iTunes bar seems to include the other albums but not the Camera Roll. I tried this answer, removing the F folders, but it didn't save that much memory for me (about 0.1GB), you may get better results. A lot of people seem to be saying it's the Mail app, log files, bookmarks, notes, calendar appointments, reminders etc but this doesn't seem to add up to gigabytes. Another thought - it appears that iOS 6 has downloaded without my permission, which would be a rather large file. As soon as the badge on Settings appeared, I noticed that it gave me the option to download and install. Until the Maps issue is resolved, I don't intend to upgrade, so I definitely haven't given it permission, but now it simply says Install Now. I tried to change the movies on my ipad 2, deleting 3 and adding a new 3 at the same time. The sizes were ok so it should have been able to fit easily. The delete happened but I did not get the space recovered. My Other category swelled. Re-syncing failed then I found powering off then on solved my problem, "other" went to a normal amount and then I was able to add my movies, I think this is rediculous but it just adds to the "others" mystery. I used DiskAid, went to Media - PhotoData - Thumbnails and deleted everything in the folder. I reclaimed 1.76GB or 3.53GB. This happens to me every three or four syncs. "Other" mushrooms to 3-4 gigs. The solution I use is to disconnect the iPad from the PC. Hard power down. Wait 10 or more seconds. Repower up the iPad and then sync. It works about 95% of the time. Not the answer you're looking for? Browse other questions tagged ipad . 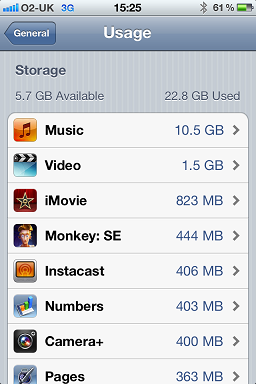 How can I clean up 'Other' storage on iPhone 3G? How to speed up an iPad 2? How to fix a situation where a new iPad 2 causes other macs to disconnect from Wi-Fi? Why iPad Air 16GB WiFi shows wrong amount of storage space free? how to delete photo stream from ipad running ios 6? How can I monitor usage of an iPad that is probably stolen?